○ Height adjustment vertically is 390~760mm. ● Bed foot part can be extended 210mm extra. Bed deck expandable in width from 36" to 42" & 48". 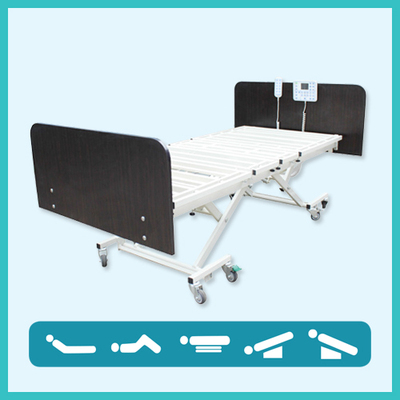 ○ Wooden bed boards, rectangular tube bed decks, bed body is with built in scale function, the nurse control can be easy to conduct all operation and locking control for the bed body, 4 pcs of 3" swivel casters & 4 pcs of total lock brake casters, four motors system, backup battery. ○ Two sectional IV pole, side rails, lifting pole, anticollison casters, mattress.